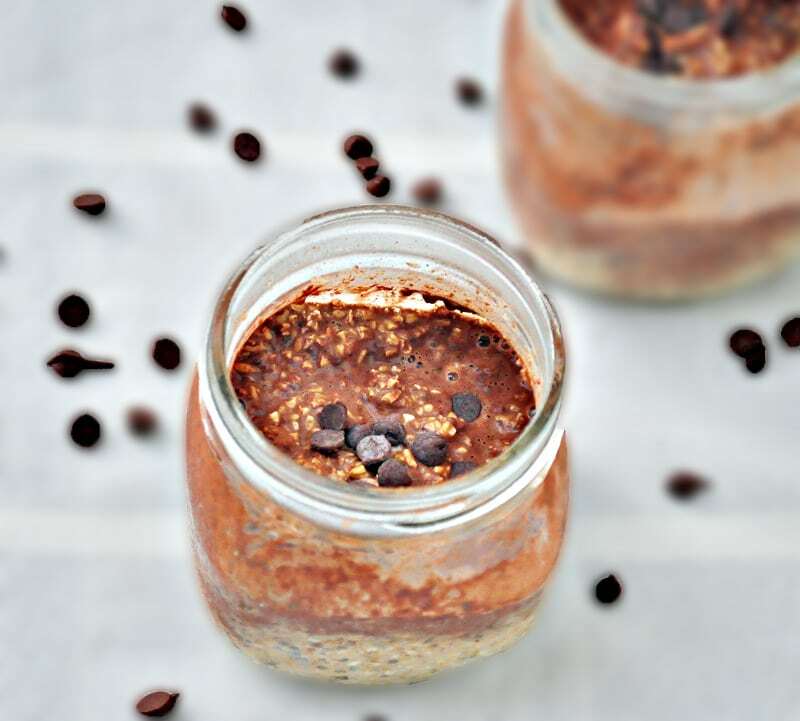 This Almond Butter Chocolate Overnight Oats is the ultimate indulgence in your daily breakfast. The best part? It’s totally healthy! Yes that’s right. This healthy breakfast is made with good for you ingredients like almond butter, cacao powder and steel cut oats. This is one of the easiest breakfasts you can make yourself. I make 5 at a time and eat them all week. My husband even takes them to work with him. They travel very well. Between the chia seeds and the cacao powder, you are getting a lot of antioxidants. Also a lot of protein and fiber! This will keep you full until lunchtime. If you don’t know what cacao powder is, it is chocolate in it’s most raw form. It can be bitter, but it’s so good for you. I usually put a chopped medjool date in my oatmeal and it turns into a caramel overnight. It gives just a hint of sweetness. You can also use maple syrup. Mix well and store in the fridge overnight to eat. My recipe makes a thicker oatmeal. If you like yours thinner, just add a bit more milk. Take out in the morning and enjoy. I eat mine cold right out of the fridge. 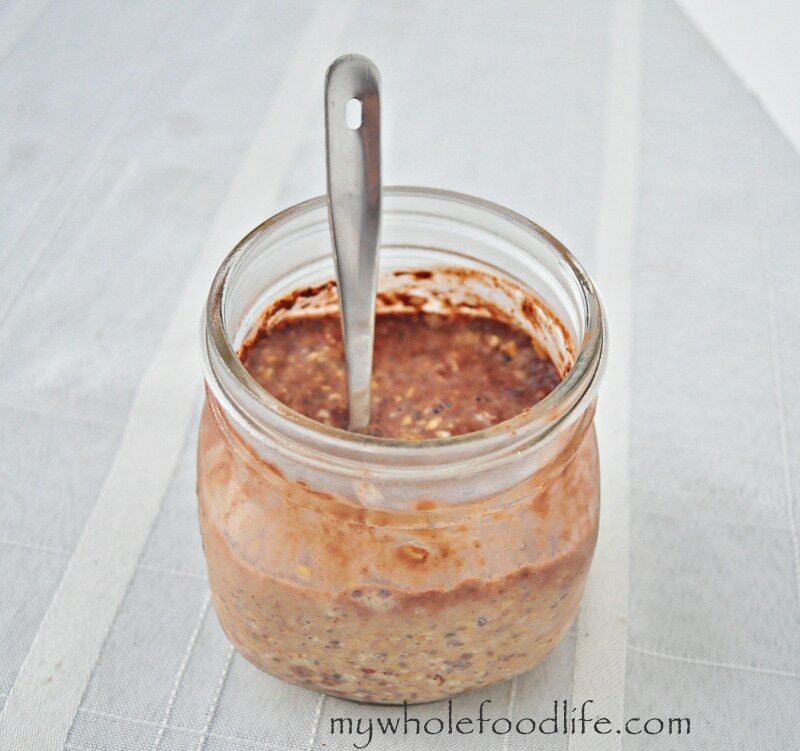 You can also try my Overnight Oats in a Jar. Is it ok to eat soaked uncooked grains? Rolled oats have been rolled under a heavy roller and using steam, so they are partially/mostly cooked. But I see that you use steel cut oats, which are completely raw. Can our bodies digest raw but soaked grains? Honest question! What a delicious way to save time at breakfast! There are flax meal and chia too -- makes the oats extra healthy. Thanks for the fabulous idea! We'd love to see more easy and healthy breakfast ideas like these. Pingback: 10 Overnight Chocolate Oatmeal Recipes You Can’t Wait To Wake Up To! Can you make all of these with whole milk instead of Almond milk? Thanks! How much is the almond butter in this? 1 tsp or tbsp? Thank you! Just made this last night and had it this morning. Didn't expect it to taste so heavenly! Hi there! Can you double or triple the recipes to have it over 2/3 days or is it fresher/better to do one portion at a time? Thank you. You can definitely make a bigger batch. I have done up to 5 at a time and they hold up great.